Wrapping the microphone wire around his wrist, the granthi stands at the front of the prayer room at the Sikh gurdwara, or temple, tucked away in a West Des Moines neighborhood with only a tall saffron-colored flag to mark its location. The granthi, or priest, recites the ardās, a prayer performed all around the world at the conclusion of Sikh services, praising God for His guidance and protection throughout the five-hundred-year history of Sikhism. The ardās is the clear link for the Des Moines community to their fellow Sikhs around the world, as it brings people together in a common religion despite distance and culture. Most of the practitioners at the Iowa Sikh Association come from the Northern Indian region of Punjab, but no matter their origin, they all share Sikhism as the basis of their identity. The granthi, Giani Chandanpal Singh Ji, concludes the ardās and the assembled seat themselves cross-legged, bowing towards the Holy Book, the Guru Granth Sahib. The granthi chants, “Waheguru,” or “Wondrous Lord,” three times, and one by one each Sikh joins in to express glory to God, the Sikhs’ ultimate Guru. Sikhism’s first human Guru, Guru Nanak, founded the Sikh religion over five-hundred years ago. Growing up in the Punjab during a time when the Muslim Mughal Dynasty ruled much of India, Guru Nanak witnessed the apparent exclusivism of Islam and the polytheism, ritualism, and classism that pervaded Hinduism at that time. He hungered for a simpler and purer path to God. One day in 1499, while bathing in a local river, Nanak disappeared, leaving behind his clothes on the riverbank. After spending three days in the court of God, Nanak returned, remaining silent. A day later, he broke his silence, proclaiming words that would inspire Sikhs for centuries to come: “There is neither Hindu nor Muslim, but only human. So whose path shall I follow? I shall follow God’s path. God is neither Hindu nor Muslim and the path which I follow is God’s.” With these words, a new religion was born. At the temple, the granthi continues his chanting. Members pass around a steel bowl containing Karah Parshad, a sacred pudding made from butter, sugar, water and whole wheat flour. At the close of the service, all practitioners partake in this sacramental offering. The pudding is traditionally made by those who intend to share their joy or sorrow with the community. “When a person is feeling happy, they share it with the community and they feel more happy,” explains Baljit Singh Virdi, a regular attendee of the Sunday service. “When a person is feeling sad, they share it with the community and they feel less sad. Happiness shared is doubled and sadness shared is halved.” Today, money is donated by several members of the assembly to provide the ingredients for the delicacy. “The same feelings apply though,” Baljit explains. It is an atmosphere of compassion. 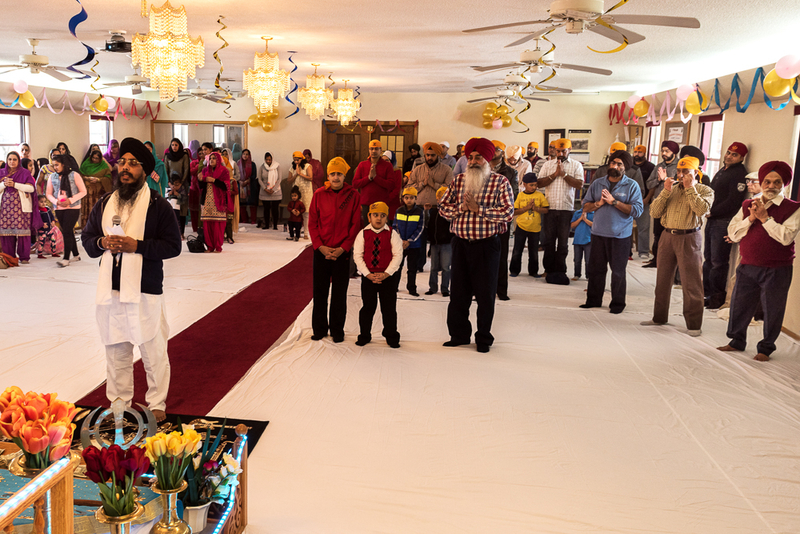 While Karah Parshad occurs in Sikh temples across the world, the small gathering in West Des Moines provides a more intimate and profound connection. Vikram Singh Chouhan, a father of two young sons, has been a part of many Sikh communities in the past, particularly in Chicago and in Dayton, Ohio. But the West Des Moines Gurdwara is where he has found the most close-knit community. “The smaller a community is, the closer it is,” he says. He was welcomed at this Gurdwara, where the two roots of the word literally mean door (dwara) to Teacher (guru), with open arms. It’s a doorway to a Teacher’s house. Whole wheat flour coats my skin as I roll out the chapati dough, my younger hands in stark contrast to Harinder Kaur’s worn fingers as she sits beside me rolling the same dough. Rolling out 200 pieces of chapati bread is just another week for her. “Rest if you need to, puttar,” she says with an affectionate tap on my wrist. The other volunteers, primarily women, working in the kitchen of the Iowa Sikh Temple speak Punjabi blended with sporadic, broken English. Though Harinder dubs me puttar, or son, the others interact simply through sweet and encouraging smiles. In Sikh temples all over the world, when services conclude the community kitchen brings everyone together to share a free meal, known as langar. Each week, a different community member graciously donates the majority of the food for that Sunday’s langar, while the chapati is made fresh in the Gurdwara’s kitchen every Sunday morning. Harinder ensures that enough food is prepared for those attending the temple. This is part of her religion; indeed, it is part of all Sikhs’ religion—to share and consume together. Along with meditation on God’s name and honest work, it constitutes one of the “three pillars” of Sikhism. I arrive about two hours before the regular prayer service begins to help prepare langar. As I peel sweet potatoes, the kirtan music begins to play within the prayer room, and I know Baljit Singh Virdi is busy setting up his video camera to record his son playing the harmonium. Around 11:30 every Sunday morning, the harmonium and drums, also called the tabla, begin their gentle twang, and the musicians sing a hymn (shabad) as people trickle in. Eventually, Harinder leaves her post in the kitchen and joins those gathered within the prayer room, seating herself on the ground, legs crossed and back against the side wall. She listens as the granthi and his son and daughter lead the kirtan. Elder members of the community sing along, chanting “Waheguru Ji Ka Khalsa, Waheguru Ji Ki Fateh”—Khalsa belongs to God, Victory belongs to God—at the end of each shabad. In the few minutes of silence between shabads, the granthi delivers a short sermon called a katha based on what he perceives as the needs of the community. After the kirtan has been played, the granthi opens the smooth leather cover of the Guru Granth Sahib and delivers a longer katha based on the hukamnama, literally the “royal decree” of the day, which is randomly selected every morning at the Golden Temple in Amritsar for all Sikhs. The Guru Granth Sahib serves as the spiritual successor and embodiment of the teachings of the ten Gurus. According to Sikh tradition, the tenth and final Guru, Guru Gobind Singh, transferred all power to the Holy Book upon his death, making it the final, living Guru. The granthi is the protector of and provider for the Guru Granth Sahib, and it is his responsibility to uphold the practice of reading from its weathered pages each week. To close the service, the granthi stands and recites the ardās, the final prayer. After recitation of the ardās the congregation rises and forms straight rows facing one another—men on one side, women on the other—in preparation for the langar. Here, there is no distinction of social class or caste. All are equal, partaking of the same food as their neighbor—yet another core principle of Sikhism. Throughout the week at the Gurdwara, a simple vegetarian meal is available for anyone in need. The first Guru, Guru Nanak, transformed the monotonous task of rolling chapatti dough two hundred times every week into a meaningful practice through his belief that no person should ever go to bed hungry. At langar on Sunday, communality arises like the steam from the freshly baked Indian bread that is broken and shared all around, making Harinder’s role here one of great worth and purpose. Gurwinder Singh Kapur locks his affectionate gaze on his son, JJ Singh, as the musicians play kirtan. JJ quickly scrolls through translations of the hukamnama to find the daily hymn from the Guru Granth Sahib which has been randomly selected that morning. Only a sophomore at Valley High School, the young man is already a leader within his religious community. “If JJ gets this, I will have done well,” Gurwinder whispers. JJ locates the translations for the Punjabi text and projects them onto a screen for the entire room to see. Gurwinder smiles proudly and explains that JJ is able to find the translation even though he isn’t very familiar with Punjabi. Many in the community do know and speak Punjabi well, like JJ’s grandfather. Due to poor health, he is seated in the back of the room on a chair and not on the floor with the rest of his family, but this doesn’t stop him from chanting through the service along with everyone else. This family of three generations, each with different backgrounds, has experienced the welcoming embrace of a Gurdwara to call their own. For Harinder Kaur, finding her way to Des Moines in 1993 started with a flood—not the famous flood city residents remember from that year, but the flood that happened across the globe in the Punjab region, prompting her immigration to the United States. She remembers fleeing with her young son to the home of a neighbor and climbing the stairs as the rising waters swept beneath her feet and across her homeland. Starting in the 1960’s, a small Sikh community in Des Moines met for worship not in their own Gurdwara but in people’s basements and living rooms. The flood of ’93 in both the Punjab and in Iowa emphasized the reality of impermanence for Iowa’s Sikh community. As the Sikh community grew, the small but vibrant group faced the frightening realization that they might never find a place to call their own. They began a search for a permanent place of worship in Des Moines. Over the next five years, they scouted locations and raised money to purchase a suitable building. Families gave all they could. With the aid of prominent Sikhs from around the Midwest, the Sikhs of Des Moines were able to purchase a former Jehovah’s Witness Kingdom Hall and set about renovating it for their needs. In went a kitchen to prepare langar and serve those in need. Out went the chairs and benches so that members could sit cross-legged on the floor and worship as equals. Streamers, flowers, and balloons now festoon the beige walls, bringing the spirit of joy and festivity to a once somber space. Children dart around the room, dodging and weaving between elderly Sikhs as they are led towards the altar. Time and history meld here, as an older generation ushers in the new. Those who helped to establish this sacred place, and those fortunate to have grown up within it both reap its rewards. More than a place of worship, the Gurdwara is a place to call home. “Why milk and not water?” a little four-year-old asks, tugging relentlessly at his mother’s dress. Eight men adorned in saffron turbans surround the tall flagpole outside of the Gurdwara. Chanting fills the air, “Waheguru…. Waheguru….Waheguru,” the atmosphere as bright as the large flag rustling in the wind. The men have cleansed the silver pole with milk and are rewrapping the flag that hung in honor of Vaisakhi. “Because that is what we do as Sikhs,” the boy’s mother answers. Milk is used to wash sacred objects in Indian religions because it is considered pure. The tall saffron flag, his mother continues, acts as a prominent feature or guiding beacon. It represents all Sikhs. “In India,” she tells her son, “the flag pole can be seen from miles and miles away.” This is not the case in Des Moines, however, where city regulations limit flag height. Although the orange banner still carries the deeper meaning of the Sikh religion, it can’t be seen past 12th and Walnut Street. Vaisakhi commemorates the founding of the Khalsa, an association of Sikhs who pledge a special devotion to their religion. When the Khalsa was established in 1699 by the last Guru, Guru Gobind Singh Ji, it served as a fighting force to protect Sikhs and their religion from persecution by the Mughal Dynasty in Delhi. These days, the Khalsa symbolizes the utmost in dedication and commitment: Khalsa Sikhs stringently follow all five of the practices known as the “5 K’s”—kesh, uncut hair; kangha, a comb to hold the hair in place; kara, a metal bracelet; kachera, special undergarments; and kirpan, a short sword. Although Vaisakhi normally falls on April 13th, the date when Guru Gobind Singh Ji first founded the Khalsa, this Sunday is actually April 17th. For the West Des Moines Gurdwara, Vaisakhi is celebrated when all members of the community can join together, with all holidays held on the closest Sunday, as that is the regular day of prayer for most Sikhs living abroad. Monikpal Singh, an undergraduate student at Iowa State University, drives down as many Sundays as he can to participate in prayer. Sikhs do not observe a Sabbath, Jumma, or Sunday service day. Sikhism does not set aside any special day for a day of prayer. In fact Sikhs stay busy every day, actively worshiping and performing seva—selfless service—for the Sikh community. Over a hundred people have gathered for the festival, putting aside issues of distance and health to make the extra effort to celebrate with each other. The Gurdwara, which usually sees an average of sixty people on a regular Sunday, is bursting with its increased numbers. Many have brought dishes to share, so food is abundant. The day is one of reconnection for the community, not only among people, but also with regard to the true meaning of the Khalsa—of what it means to be a Sikh. Dr. Harpal Singh Bal, a retired professor of veterinary medicine from Iowa State University, recalls the “dusty basement” days of the Sikh community when they were a small group and did not yet have a temple. Nowadays, due to health limitations, he only makes it to the Gurdwara on special occasions. His experience, which spans decades and continents, contrasts with the little boy watching the bathing and rewrapping of the flag and pole with his mother. The Sikh community holds true to their history and tradition in all that they do, but they have also adapted to their new home in the heartland of the United States. From the day of the week they have chosen for prayer to the necessity of abiding by flag height regulations, Sikhs have adapted to accommodate their new environment. However, certain elements remain true despite the cultural divide. Covering one’s head is a sign of respect, expected of both men and women. The Gurdwara provides head coverings for those who do not usually wear turbans. In Sikhism, the turban is the traditional head covering of Sikhs who follow the “5 K’s” and serves as a way to identify fellow believers. However, the choice to cut one’s hair is a personal one, and not everyone at the West Des Moines Gurdwara practices this tradition. Individuals are treated no differently whether they uphold kesh or not. In a post 9/11 world, growing up in America made some Sikhs re-evaluate these long-standing articles of faith. Monikpal is one such Sikh who cuts his hair and does not wear a turban. He explained that 9/11 “made my parents not want me to wear a turban. A lot of Americans saw turbans and thought ‘terrorist.’” The turban is not the only distinctive feature of those who belong to the Sikh community. Sikhs choose to practice their faith in various ways, choosing when they will come to prayer and how they will raise their families. Because Sikhism is comprised of diverse individuals and practices, these elements do not divide; they combine to create a unique religious community here in the heart of Iowa.